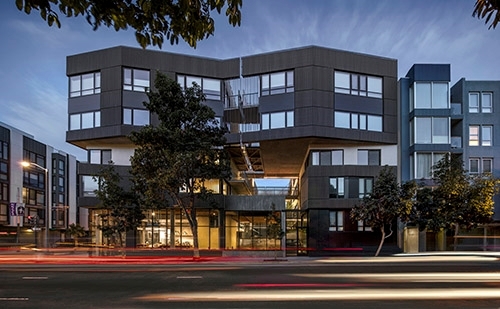 400 Grove Street is a 34-unit mixed-use development in the heart of Hayes Valley, San Francisco. The project has received a 2016 American Architecture Prize, among other accolades. FAYETTEVILLE, Ark. – Anne Fougeron will present a lecture at 4:30 p.m. Monday, Feb. 12, in Ken and Linda Sue Shollmier Hall, Room 250 of Vol Walker Hall, on the University of Arkansas campus, as part of the Fay Jones School of Architecture and Design lecture series. Fougeron is principal of Fougeron Architecture in San Francisco, California. Since establishing her practice in 1986, Fougeron has worked to build the practice into a nationally recognized design firm, with a variety of works that include commercial, civic, residential and multi-family housing. Her vision was to create a practice dedicated to finding the perfect alignment between architectural site, idea and built form, and her work is defined by her innovative use of structure, materials and natural light. Fougeron is a visiting professor in the Fay Jones School this semester, as part of the school's Housing Northwest Arkansas initiative. In her lecture, titled "Home Sweet Home," Fougeron will discuss her design philosophy of humane modernism. Whether she is transforming existing buildings or creating entirely new environments, her thoughtful, rule-bending designs address the aspirations, opportunities and challenges that come with each project. Her buildings tread lightly on the earth. Her ethos encompasses environmental responsibility and ingenuity, and she works tirelessly within the bounds of nature and the laws of physics, capturing or tempering daylight, drawing in fresh air, naturally modulating heat and cold, and engaging color and volume — all while embracing emerging technologies, products and sustainable materials. The presentation will examine a sampling of built and in-progress work, including single-family homes and multi-family mixed-use developments, focusing on how the projects sit within the context of their sites, whether natural or urban, and how these forces inform the design. Fougeron's projects range in type from single-family homes to urban infill developments that explore different levels of affordability. Fougeron received a Bachelor of Arts in architectural history at Wellesley College, and a Master of Architecture from the University of California, Berkeley. She has taught architecture design to undergraduate and graduate students at the California College of the Arts in San Francisco and at the University of California, Berkeley, where she served as the Howard Friedman visiting professor of professional practice from 2003-2004. Throughout Fougeron's 30 years as an architect, she has served on more than 20 design juries, provided pro bono work to various non-profit organizations and given architecture lectures around the world. To date, her firm has received more than 50 design awards and has been featured in more than 200 publications. This also is the Mort Karp Memorial Lecture, sponsored by Polk Stanley Wilcox Architects. This lecture has been approved for health, safety and welfare continuing education credits through the American Institute of Architects.